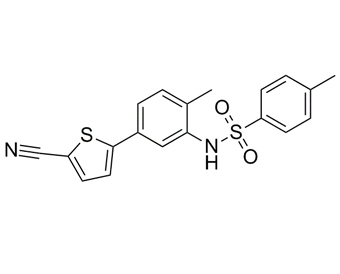 ELR510444 is a potent microtube disruptor with potential anticancer activity. ELR510444 has potent microtubule-disrupting activity, causing a loss of cellular microtubules and the formation of aberrant mitotic spindles and leading to mitotic arrest and apoptosis of cancer cells. ELR510444 potently inhibited cell proliferation with an IC(50) value of 30.9 nM in MDA-MB-231 cells, inhibited the rate and extent of purified tubulin assembly, and displaced colchicine from tubulin, indicating that the drug directly interacts with tubulin at the colchicine-binding site.
. Risinger AL, et al. ELR510444, a novel microtubule disruptor with multiple mechanisms of action. J Pharmacol Exp Ther. 2011 Mar;336(3):652-60.
. Carew JS, et al. ELR510444 inhibits tumor growth and angiogenesis by abrogating HIF activity and disrupting microtubules in renal cell carcinoma. PLoS One. 2012;7(1):e31120.